Menulog delivers for Wong Hawker's Food so you'll be able to track your courier on a map. Deep fried crispy prawn crackers. Vegetarian deep fried spring rolls with sweet & sour sauce. Deep fried battered prawns with a side of sweet chilli sauce. Five spice marinated pork rolls wrapped with bean curd skin and deep fried. Grilled chicken skewers with a side of satay sauce. Plain Roti with a side of chicken curry. Grilled beef skewered with a side of satay sauce. Deep fried tofu covered in satay sauce garnished with sliced cucumber and beansprouts. Deep fried battered squid tentacles. Battered and deep fried chicken in sweet and sour sauce with onions, carrots, capsicum, cucumber and pineapples. Half a deep fried chicken. Deep fried battered chicken coated with sweet chilli & honey. Deep fried battered chicken coated in honey sauce. Deep fried battered chicken breast slices with lemon sauce. Half a deep fried chicken with spicy vinegar sauce. Half a duck braised in special dark soy sauce with spices. Battered and deep fried spare ribs coated in a thick sweet and sour sauce. Battered and deep fried spare ribs garnished with cut chillies and spring onion. Battered and deep fried pork in sweet and sour sauce with onions, carrots, capsicum, cucumber and pineapples. Stir fried Beef with onions, carrots, baby corn, celery and green peas. Stir fried chicken or beef with carrots, cauliflower, broccoli, baby corn, Chinese cabbage, choy sum and beansprouts. Stir fried chicken or beef with onions, ginger and spring onions. Stir fried chicken or beef with Chinese vegetables in oyster sauce & garlic. Stir fried chicken or beef with onions, baby corn, carrots, Chinese mushrooms, snow peas and spring onions. Stir fried chicken or beef with onions, carrots, broccoli, capsicum, cauliflower and black beans. Stir fried chicken or beef with onions and cucumber in peanut sauce. Half a steamed chicken with special soy sauce. Stir fried chicken or beef with leek, spring onions, onions and carrots in Mongolian sauce. Stir fried prawns, squid, beef and chicken with onions, spring onions, capsicum in a spicy Szechuan sauce. Half a roasted duck with a side of special sauce. Stir fried chicken or beef with onions, carrots, broccoli, capsicum, pineapples in Kungpo sauce. Stir fried prawns, squid, beef and chicken with onions, spring onions, capsicum in Kungpo sauce. n assortment of meats (Roast Pork, Barbeque Pork and Steamed Chicken). Stir fried chicken or beef with onions, carrots, spring onions and capsicum in pepper sauce. Stir fried prawns with onions, carrots, spring onions, snow peas and cauliflower with garlic sauce. Stir fried Japanese tofu with chicken mince, carrots, baby corn, mushrooms and spring onions. Battered and deep fried fish fillets in sweet and sour sauce with onions, carrots, capsicum, cucumber and pineapples. Battered and deep fried fish fillets, stir fried with onions, ginger and spring onions. Battered and deep fried prawns coated in honey sauce. Stir fried prawns with onions and cucumber in peanut sauce. Battered and deep fried prawns topped with mayonnaise. Battered and deep fried squid garnished with cut chillies and spring onion. An aromatic dry spicy Malaysian beef curry. Battered and deep fried fish fillets with onions, pineapples, okra, and tomatoes in a sour spicy tamarind sauce. Battered and deep fried fish fillets with onions, carrots, okra, tomatoes, pineapple in curry sauce. Beef slices with onions, carrots, green peas in curry sauce. Chicken drumsticks stewed in a Malaysian curry sauce. Diced chicken with onions, carrots and green peas in a Malaysian curry sauce. Stir fried king prawns with onions, carrots, okra, tomatoes in a spicy sambal sauce. Deep fried bean curds stir fried with prawns, squid, carrots, cauliflower, broccoli, baby corn, Chinese cabbage, snow peas and mushrooms. Bean curd stir fried with chicken baby corn and green peas with a thick sauce. Deep fried bean curds stir fried with prawns, squid, chicken/beef/pork with prawns, squid carrots, cauliflower, broccoli, baby corn, Chinese cabbage, snow peas and mushrooms. A Cantonese style Beef Brisket in a thick dark sauce with Chinese vegetables. A chicken omelette with onions, green peas, spring onions, beansprouts, carrots, with gravy. A vegetable omelette with onions, green peas, spring onions, beansprouts, carrots, with gravy. A prawn omelette with onions, green peas, spring onions, beansprouts, carrots, with gravy. A combination omelette of chicken, barbeque pork and prawns, with onions, green peas, spring onions, beansprouts, carrots, with gravy. A King prawn omelette with onions, green peas, spring onions, beansprouts, carrots, with gravy. Stir fried chicken or beef with Chinese cabbage, cauliflower, Broccoli, Baby Corn, Carrots and Coy Som and crispy noodles on the side. Stir fried prawns, squid, beef and chicken with Chinese cabbage, cauliflower, Broccoli, Baby Corn, Carrots and Coy som and crispy noodles on the side. Stir fried prawns, squid and deep fried battered fish with Chinese cabbage, cauliflower, Broccoli, Baby Corn, Carrots and Coy som and crispy noodles on the side. Steamed chicken with a special soy sauce and chicken rice. Deep fried crispy chicken with a special soy sauce and chicken rice. Braised chicken with a special soy sauce and chicken rice. Braised duck with a special soy sauce and chicken rice. Barbeque pork with barbeque sauce and chicken rice. Roast pork with barbeque sauce and chicken rice. A combination of 2 meats (Chicken/Barbeque Pork/Roast Pork) with chicken rice. A combination of 3 meats (Chicken/Barbeque Pork/Roast Pork) with chicken rice. Malaysian chicken curry with steamed rice. Coconut rice with a deep fried fish and chicken wing with dried anchovies, half a hard-boiled egg, peanuts and cucumber for sides. Malaysian style fried rice with chicken, prawns, egg, peas and a fried chicken wing on top. Stir fried rice with salted fish, chicken, egg, peas and beansprouts. Singaporean style fried rice with chicken, egg, peas and beansprouts. Singaporean style fried rice with beef, egg, peas and beansprouts. Stir fried rice with prawns, egg, peas and beansprouts. Stir fried rice with prawns, squid, egg, peas and beansprouts. Stir fried rice with prawns, barbeque pork, chicken, egg, peas and beansprouts. Pork ribs cooked in a broth of herbs and spices Singaporean style served with steamed rice. Stir fried beef with onions, carrots, broccoli, capsicum, cauliflower and black beans with steamed rice on the side. Stir fried prawns, squid, beef and chicken with Broccoli, Carrots, Cauliflower, Baby Corn and Chinese cabbage with steamed rice on the side. Roast Duck with a special duck sauce and chicken rice. A large or small container of steamed rice. Stir fried seafood, pork and Chinese vegetables in a thick broth on a nest of crispy noodles. 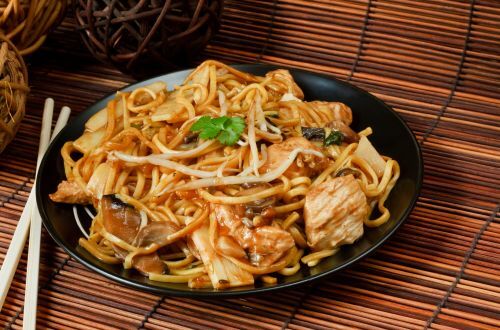 Stir fried seafood, pork and Chinese vegetables in a thick soy sauce gravy with noodles. Stir fried seafood, pork and Chinese vegetables in a thick egg broth with stir fried flat rice noodles. Stir fried flat rice noodles with prawns, pork sausage, fish cake, spring onions and beansprouts. Stir fried rice noodles with prawns, chicken, barbeque pork, capsicum, onions and beansprouts. Stir fried egg noodles with prawns, chicken, fish cake, and beansprouts with a lemon on the side. Stir fried seafood, pork and Chinese vegetables in a thick egg sauce broth with stir fried flat and thin rice noodles. Stir fried seafood, pork and beansprouts in a prawn broth with egg noodles. Stir fried seafood, pork and mixed vegetables in a thick egg broth on a nest of crispy noodles. Stir fried chicken in a spicy and sour gravy with rice noodles. Stir fried seafood, pork and chinese vegetables in a broth with wheat flour noodles. Stir fried flat rice noodles with beef, spring onions and beansprouts. Stir fried rice noodles with beef, onions and beansprouts. Stir fried egg noodles with sliced roast duck, onions and green vegetables. - (Dry) ¼ Braised duck and Chinese vegetables with thin egg noodles special soy sauce. - (Soup) ¼ Braised duck and Chinese vegetables with thin. A mixture of egg and rice noodles in a coconut milk based curried soup topped with Yong Tau Foo and beansprouts. A mixture of egg and rice noodles in a coconut milk based curried soup topped with chicken, prawns, fish balls, tofu and beansprouts. A mixture of egg and rice noodles in a coconut milk based curried soup topped with prawns, squid, fish cake, and beansprouts. - (Dry) Thin egg noodles with barbeque pork, and steamed pork wontons in a thick special soy sauce with Chinese vegetables. - (Soup) Thin egg noodles with barbeque pork, and steamed pork wontons with Chinese vegetables with a soup on the side. - (Dry) Thin egg noodles with shredded chicken and steamed pork wontons in a thick special soy sauce with Chinese vegetables. - (Soup) Thin egg noodles with shredded chicken and steamed pork wontons with Chinese vegetables with a soup on the side. - (Dry) Flat egg noodles with barbeque pork, and steamed pork wontons in a thick special soy sauce with Chinese vegetables. - (Soup) Flat egg noodles with barbeque pork, and steamed pork wontons with Chinese vegetables with a soup on the side. A mixture of egg and rice noodles in a rich prawn broth topped with sliced pork, half a hard-boiled egg and beansprouts. - (Dry) A mixture of egg and rice noodles with a special dark soy sauce topped with Yong Tau Foo and beansprouts. - (Soup) A mixture of egg and rice noodles topped with Yong Tau Foo and beansprouts with a soup on the side. A sour and lightly spicy tamarind based soup with thick egg noodles, shredded fish, cucumber, cabbage, pineapples and shrimp paste drizzled on top. A mixture of egg and rice noodles topped with shredded chicken, prawns and fish cake and beansprouts with a soup on the side. A mixture of egg and rice noodles topped with fish balls, Chinese vegetables and beansprouts with a soup on the side. Cantonese style Beef Brisket in a thick dark sauce with thin egg noodles and Chinese vegetables. Egg noodles in a thick dark gravy topped with sliced pork, half a hard-boiled egg and beansprouts. Deep fried fish fillets served with thin rice noodles in a soup of salted vegetables, mushrooms and tomatoes. A Thai hot and sour soup with prawns, squid, and thin rice noodles garnished with coriander. topped with a choice of meats. Steamed wontons and Chinese vegetables in clear chicken soup. A Thai hot and sour soup with prawns, squid garnished with coriander. A soup with salted vegetables and diced bean curd. A thick soup with prawns and squid with diced bean curd. Fish balls and Chinese vegetables in clear chicken soup. A thick egg broth with sweet corn and diced chicken.